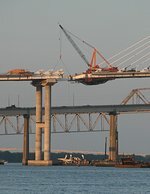 The Ravenel Bridge (2002 - 2005) was a design-build project where the design and construction aspects of the project overlap. 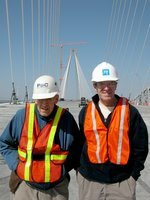 From August 23, 2003 until July 16, 2005, I tracked the construction of the Ravenel Bridge than this web site evolved from a so-so grandkids project to a passion. SCDOT (Bobby Clair), PBC (Wade Watson, Peo Halvarsson, Marvin Tallent), High Steel (Bill Mankin) and Freyssinet (Olivier Forget) opened many doors for me. 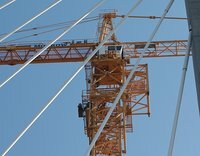 Skanska has provided an excellent summary of the major innovations of our bridge. 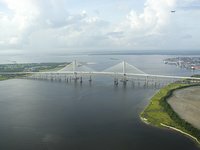 The Ravenel Bridge replaces the Grace Bridge (1929 - 2007) and the Pearman Bridge (1966 - 2007). 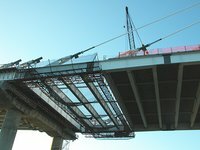 It was a privilege to look inside the project and, with photo essays, document many of the bridge construction processes. 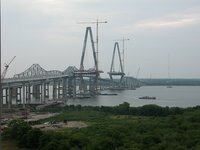 While the building is complete, the story of the builders and the Charleston Community continues. I moved to Singapore in March of 2006. In Singapore, my photo interests shifted from construction processes to behavior of small insects and spiders.